Nidderdale, being one of the dales in the Yorkshire Dales, is the upper valley of the River Nidd but it does not lie within the Yorkshire Dales National Park. Pateley Bridge is Nidderdale’s only town but the villages of Wath, Ramsgill, Lofthouse and Middlesmoor lie above the town and below there are the villages of Bewerley, Glasshouses, Summerbridge, Dacre, Darley, Birstwith, Hampswaite and Kettlesing. Nidderdale designated an Area of Outstanding Natural Beauty in 1994, is a really stunning valley with the picturesque Scar House Reservoir situated above Lofthouse, Stean and Middlesmoor. The dramatic landscape provides excellent walking, cycling, horse riding, llama trekking, bird watching or you can just relax and soak up the scenery. For the walker there are 820 km of public footpaths and bridleways from long distant routes such as the Nidderdale Way to easy strolls. For the cyclist there is a good network of quiet lanes and off road tracks as well as a section of The National Byway Britain’s heritage cycling route and there are also miles and miles of tracks for mountain bike riding. The new right of access came into force in 2005 and has allowed 200 square kilometres of access land to be walked freely. For the horse rider there is a bridleway network covering more than 170km. Llama Trekking is an unforgettable experience and Nidderdale Llamas run guided treks from two hour sessions to a full day trek. For the birdwatcher the habitats from moorlands and reservoirs to woodlands attract a great range of garden and passerine birds, wildfowl and waders. So the dale has much to offer to suit everyone’s ability and interest. Middlesmoor is a small unspoilt tranquil village with cobblestones situated on a hill at the head of the Nidderdale valley. The village pub, the Crown Hotel, with breathtaking views of the Nidderdale valley offers bed & breakfast, a cosy cottage or campsite accommodation. The village church of St Chad’s also overlooking the Nidderdale valley is said to have one of the best views from any church in England. The present church, dating from 1866, is a Grade II listed building. From the car park we make our way past the toilets and cafe to the reservoir. We walk along the dam to the other end, turn left uphill then turn right at the signpost onto the Nidderdale Way. We keep following the track uphill through the gates the track levels out slightly for a while before we head downhill to cross over a bridge. We then head steeply uphill still following the track which bears right. We now just continue heading forward on the track until about 100 yards before a shooting hut with two chimneys. We turn right downhill on a faint path to the gate we can see in the wall. We go through the gate and bear half right downhill to the wall corner then turn sharp left still going downhill. We go through a gate and keep heading downhill. We go through another gate and keep heading forward following the wall on our left. When the path splits we take the left path, marked with an arrow following the Nidderdale Way, uphill towards the farm buildings. We cross a stream and small waterfall then past the farm buildings on our right. We continue forward on the track passing a number of buildings on our right and when the track splits we keep right downhill. The track eventually bears right below a large clump of trees and we continue to follow the track. When we come to a gate across the track we take the small gate on the right through a small tree area. We go through the next small gate and head straight forward, to the right of the house, to follow a path with the wall on our left. We start to go downhill to the farm at the bottom. At the farm we cross over the dry river bed and continue through the farm to a gate with a yellow band and an arrow. We head forward for a short way towards the river then drop down into a dip to go through a gate. We then continue to follow the path with the dry river bed on our left. We soon go through a gate and cross over the river to the other side. We continue following the path to Thorpe Farm. After passing the farm buildings on our right we turn right following the track, leaving the Nidderdale Way, to cross a bridge and meet the tarmac track/road. We turn left along the road for a short way then take footpath on the right sign posted Middlesmoor. We cross over two stiles then head uphill through the fields, crossing over two more stiles. When we reach the wall we keep heading forward. In the corner of the field we cross over a stile and keep heading forward steeply uphill towards the houses of Middlesmoor. At Middlesmoor we pass the church on our left head forward then turn right then left between the houses. At the road we turn right back onto the Nidderdale Way passing the pub on our left uphill. We follow the road past the car park and at the end of the tarmac road we continue on the stony track steadily uphill. The track eventually levels out for a while before heading downhill to Scar House Reservoir and the car park. 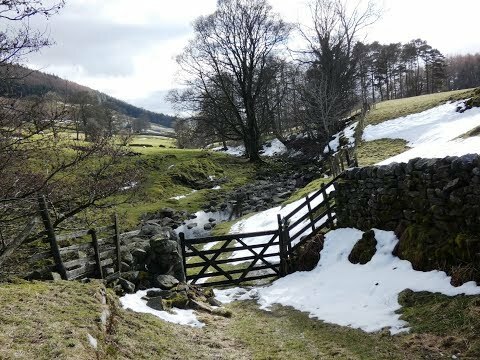 This is a moderate walk on the Nidderdale Way on distinctive grass/gravel/ tarmac tracks and paths. There are some inclines and declines. Elevation: approx lowest point 195.50m (641.40ft) approx highest point 435.40m (1428.48ft) approx ascent 640.90m (2102.69ft). Approx 9.10 miles allow 4-5 hours using OS Explorer Map 298, Nidderdale, Fountains Abbey, Ripon and Pateley Bridge. This walk is done clockwise. Start point: Scar House Reservoir car park. The Nidderdale valley, in the Yorkshire Dales. Parking: Scar House Reservoir free car park. There are public toilets at Scar House Reservoir and also in Pateley Bridge located in the park area and in one of the car parks. For refreshments there is a cafe at Scar House ‘The Cabin’ only open Saturday and Sunday from Easter to the end of autumn, 11am to 4.30pm. At Middlesmoor there is the Crown Hotel, at Ramsgill there is The Yorke Arms and at Lofthouse there is the Crown Hotel both the latter have accommodation. There are also shops, cafes, a butcher, fish and chip shop and three pubs at Pateley Bridge.